Whether you’re looking for a base tan to build over the summer at the shore or a custom spray tan to rock at an upcoming beachfront wedding, the plentiful tanning salons in New Jersey will ensure that you’re glowing. The following 10 salons also offer an array of tanning products and other services, such as teeth whitening, manicures, and hair styling, that will compliment bronzed skin. Work with the friendly and knowledgeable salon staff to build your perfect tan level, and take advantage of the great packages at these excellent tanning salons in New Jersey. This family owned business features a clean and bright interior with top of the line tanning beds so that you can achieve the level of glow you desire. The prices for tanning sessions here vary depending on the bed type, but numerous options are available ranging from a single session to six months unlimited. They also sell a line of high quality tanning supplies and hydrating lotions. Offering a range of beauty and hair treatments for both men and women, Heatwave Hair and Tanning is the most comprehensive salon on our list. Visit for 30 minutes to touch up your tan, or spend the day for a haircut and manicure, hair removal, and spray tanning, allowing you to be event ready with one stop. Four different tan levels can be achieved using their laydown or standup beds. Open for more than 20 years, Copper Tans Salon helps you to make your outside match your inside. This salon offers both UV tanning in beds and spray tanning, including custom tans with four different levels. Copper Tans Salon also offers teeth whitening to enhance your smile, matching your glowing skin. Surf City Tans helps you to achieve smooth, even skin with their infared body wraps, UV tanning, and spray tanning. For those who already have a solid base tan, opt for the high-pressure UV tanning to darken your tan without fear of burning. And if you just need a lovely glow before an event, the auto spray booths at Surf City Tan will have you bronzed without any hint of orange. Sunsation Tanning is a longstanding tanning salon that has been helping people get glowing skin for more than 30 years. 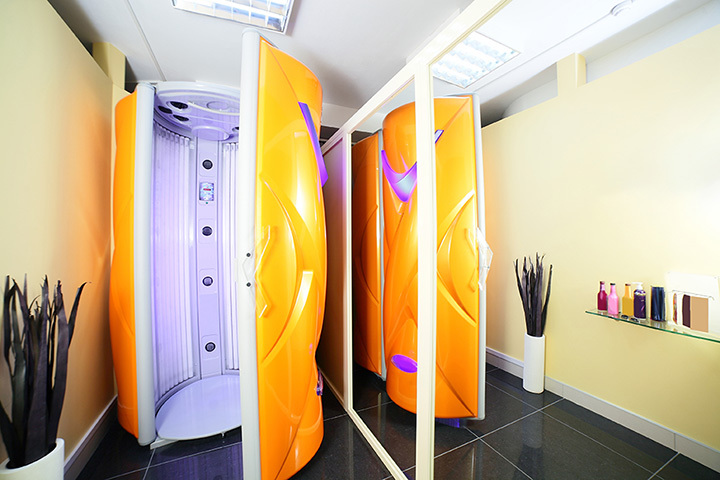 It offers tanning beds and standup units with four different levels of tan. For sunless tanning, Sunsation Tanning also offers custom airbrushing for that ultimate sun kissed look that is perfect for a summer spent on the beach. Tiki Image offers both tanning and spa services, making this a one-stop destination for nearly all of your beauty needs. Indulge in treatments such as waxing, lash extensions, facials, massage, and traditional tanning beds. It also offers sunless tanning, with special deals for first time visitors. Tiki Image also offers student discount programs. After getting a VersaSpa spray tan at Beach Body Tanning, treat yourself to eyelash extensions or red light therapy, which is excellent for acne treatments. Work with the staff here to reach your ideal level of tan with either a tanning bed, standup unit, or spray tan. Discounts are also available for senior citizens, students, and military personnel, making maintaining a beautiful tan more affordable. Highlight your natural curves by enhancing your skin tone with a tan at City Tropics Tanning, which features two locations in New Jersey for your convenience. Nine different tanning beds are offered at City Tropics Tanning, including both laying down and standing beds. Spray tanning using the Versaspa standup machine is also available for those who prefer to avoid UV exposure. Planet Sun Tanning makes getting beach ready easy with its complete set of services: teeth whitening, tanning, and red light therapy. Get a specialty tan here, with a customized airbrush tan allowing you to achieve a deeper tan the safe way. They specialize in tans for bodybuilding, pageants, and bikini. Eleven different types of tanning beds are available at Planet Sun Tanning Salons. Summer Illusions is a locally owned spot that has been helping locals to achieve their desired level of bronze since 2000. The salon features the latest in tanning technology and the most highly rated tanning products, ensuring that bodies are bronzed safely. They also offer custom airbrush spray tanning by appointment, if you are seeking a quick, safe way to get glowing before a party or special event.